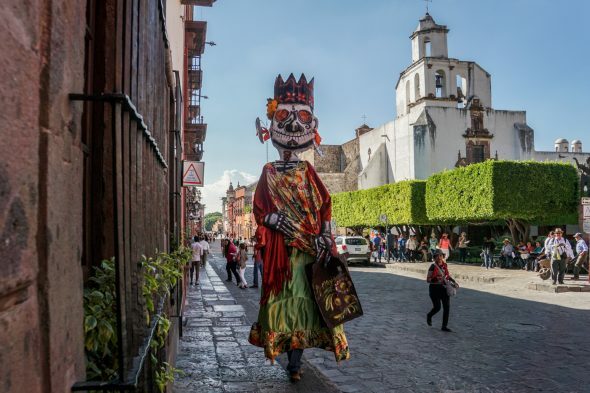 Arriving in San Miguel de Allende, Mexico precisely in time for Day of the Dead, we enjoyed an exceptionally festive atmosphere. But in reality, there’s always some sort of celebration happening in this colorful town. The residents are friendly, respectful, and welcoming of visitors. 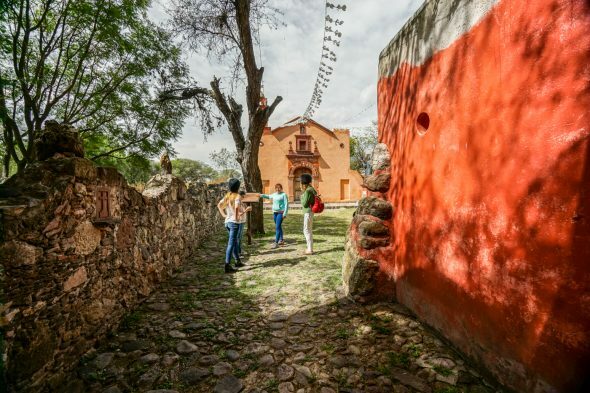 It has a safe, small-town feel, where people recognize each other and say ‘hola’ on the streets, but it’s large enough to find nearly any amenity. 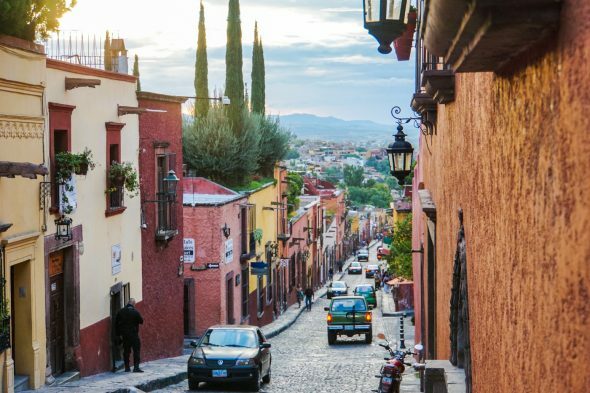 The downtown area is packed with interesting architecture, cobblestone streets, colorful houses, artisan shops and markets, and delicious restaurants. And, it’s superbly walkable with high cleanliness and air quality. Food is reasonably priced and so are the taxis. 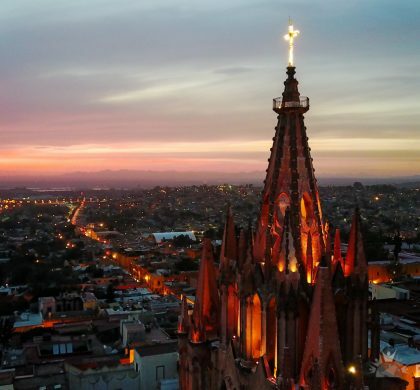 The temperate weather has earned the distinction of “eternal spring”, with temperatures cooler at night and sometimes a bit hot during the day. You can rent a furnished 3-4 bedroom house for USD $600-1,000/month if you look locally, book yearly, and negotiate. Otherwise, there are plenty of Airbnb options, as well as hotels. There are increasing numbers of families with children and even a small but growing alternative education community. 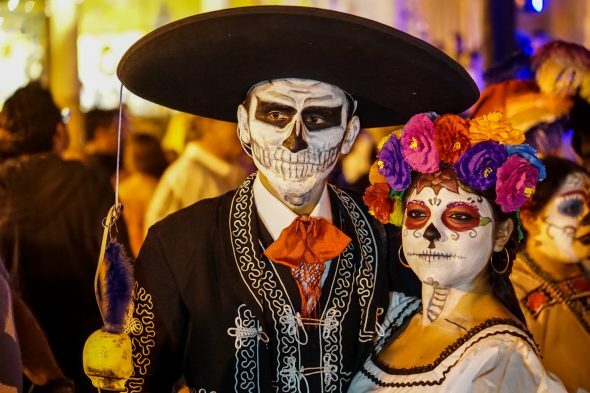 We ate street food on Day of the Dead, such as horchata, enchiladas, and tacos, prepared in true Mexican style, which is quite a bit different than the altered Mexican cuisine we’ve experienced elsewhere around the world. Freshly made corn tortillas, slow-cooked shredded and chopped meats, and the white crumbly cheese called Queso Fresco — were all a true delight to our tastebuds. 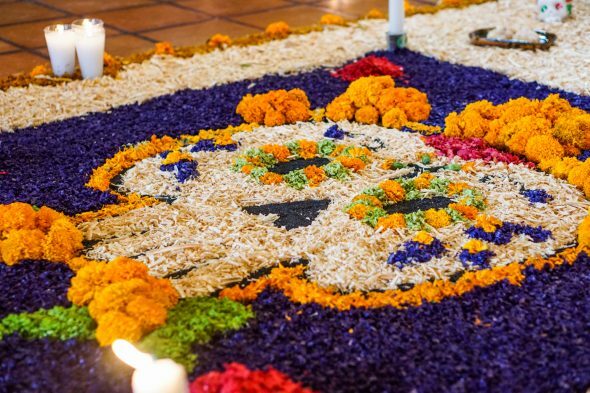 Day of the Dead is when family and friends gather together in prayer and remembrance of loved ones who have died, and help support their spiritual journey. People go to the cemeteries to be with the souls of those who have passed on. 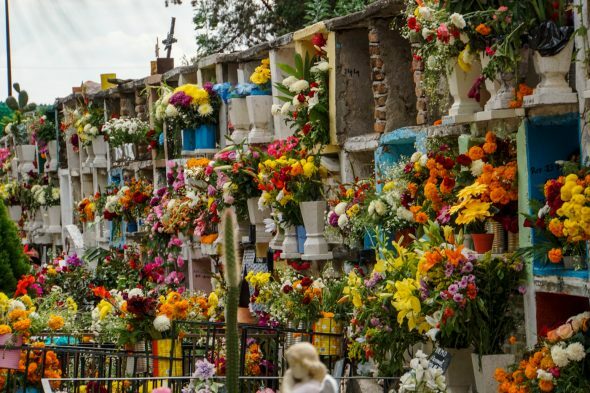 Private altars called ofrendas are built in honor of the deceased, using sugar skulls, marigolds, favorite foods and beverages, as well as photos and memorabilia of the departed. The intent is to encourage visits by the deceased loved ones, so they will hear the prayers and the comments of the living directed to them. We walked to Juarez Park where there were lots of activities for the holiday. 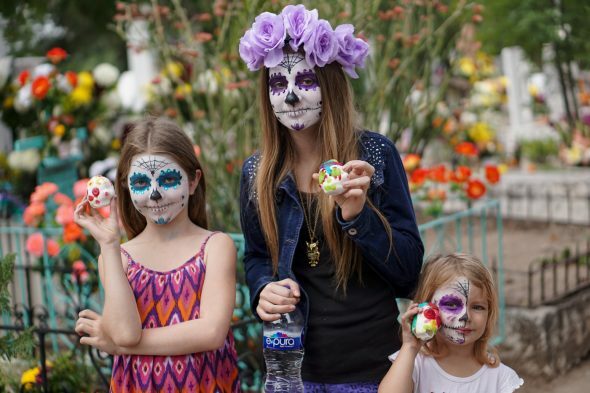 The girls decorated sugar skulls, which was a bit treacherous with all the bees buzzing around, attracted to the sugar. In fact, I did get stung under my armpit by one of them, but thankfully everyone else escaped unpunctured. The girls each got their own sugar skull style face makeovers for the occasion. 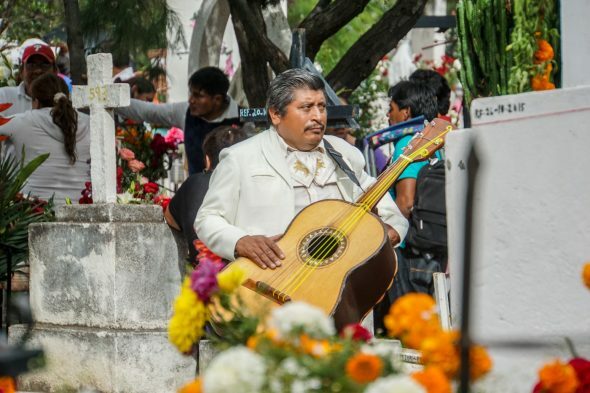 We took a taxi to the cemetery to see the graves decorated with flowers and sugar skulls where there were also Mariachi bands milling about for the holiday. We walked to The Jardín at the city center and bought some Mexican treats such as chocolate cinnamon cookies, a strawberry roll, and tamarind chili candies. We also bought a couple varieties of Magnum ice cream bars, apple cinnamon and chocolate creme brûlée. We’ve noticed there seem to be different flavors of Magnum in each country we visit, which we haven’t found elsewhere. I guess it helps to be a world traveler to experience all the various types! 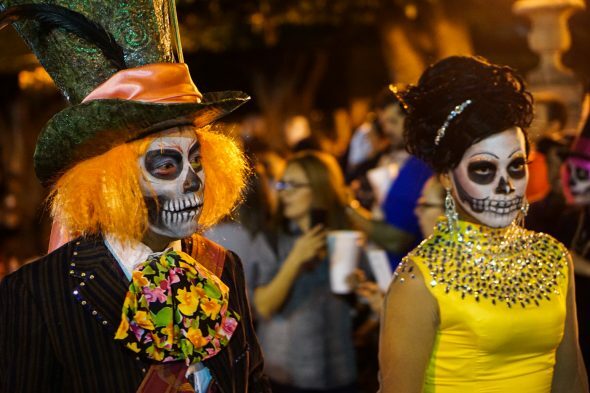 We saw the parade as it came through the park, with people dressed up in the sugar skull face paint and costumes; it was a small and silent procession. We watched some lively music and dancing performances on the stage afterwards. 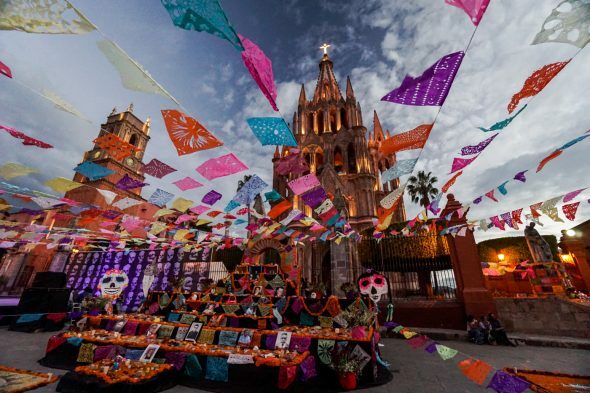 We admired the decor in the park, especially the intricately designed, colorful flags hanging above our heads from horizontal strings, with the breathtaking Parroquia de San Miguel Arcangel in the background. The atmosphere felt comfortingly serene, somehow, almost like being held in a cozy soft blanket. We walked back to our gorgeous vacation home around 9:00pm, which was a convenient 15 minute walk from the center of town. We were able to negotiate the monthly rate, even though our stay was only three weeks, which ended up being quite a significant discount! 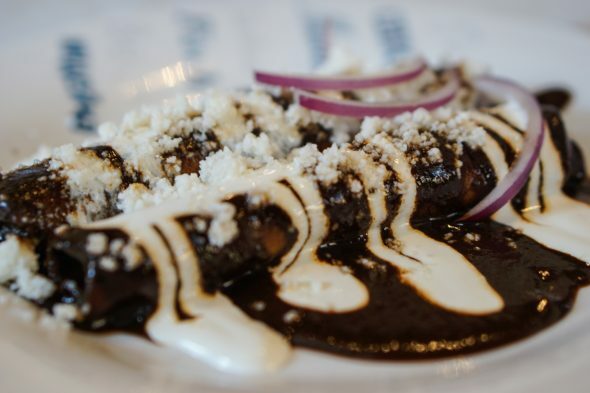 We went out to several delicious restaurants during our time in San Miguel, including the places introduced to us during our Taste of San Miguel food tour. There were a few nights we ordered food in, such as pizza and also some delicious sushi from Sushigami. We also hired a cook to make meals for us on many occasions, when we spent days at home. I especially liked her cheese enchiladas with salsa verde, chicken tostadas, and burritos. We did spend quite a bit of time working in the house on different projects like music, singing, and Skype lessons. Brandon also spent a generous amount of time on the new Pearce On Earth website, which we’re really happy to have beautifully upgraded now, with more additions coming soon. 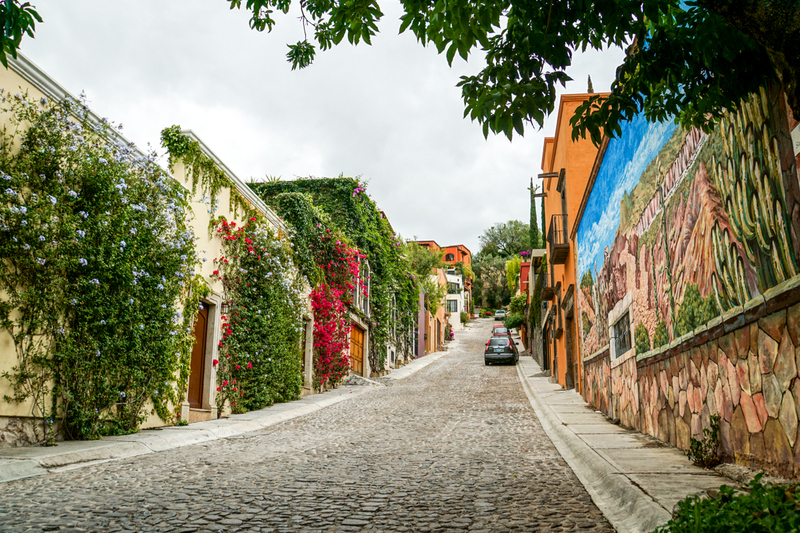 We spent one day entirely out on the town, starting with breakfast at a particularly delicious restaurant, Dana at the Market, which as you may guess from the name, is close to the San Miguel Artisans Market and the Ignacio Ramirez Market. 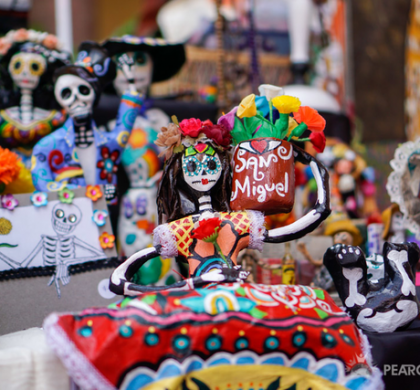 We checked out the markets afterwards, and purchased a few bits and bobbles, including some beaded jewelry as well as some treats like dulce de leche candies, and a camote enmielado, which is a sweet potato cooked in a dark syrup of unrefined cane sugar and cinnamon. We continued our day by walking toward the cultural center, stopping into whichever shops piqued our interest along the way. En route, we stumbled upon a library in a beautiful old building which, of course, we had fun exploring. Progressing toward the cultural center, we spotted a mojiganga, which is a giant puppet mounted on a tall supporting A-frame structure. The puppeteer wears a shoulder harness underneath, to support the weight of the head and bust. 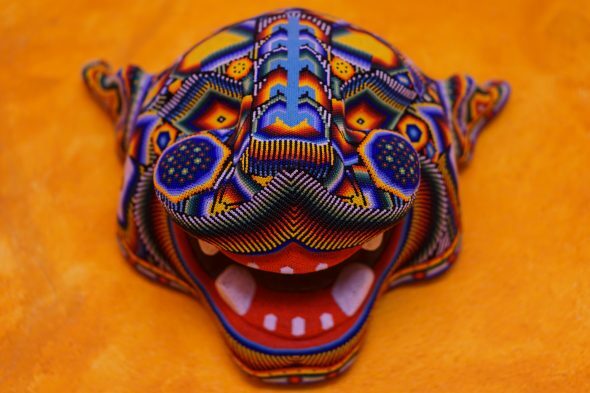 Intended to provoke wonder as an exaggerated expression of humanity, the mojiganga make appearances in a variety of festivals, special birthdays, anniversaries, and wedding celebrations. Look closely and you might be able to see the little hole near the belly where the person inside can see out. 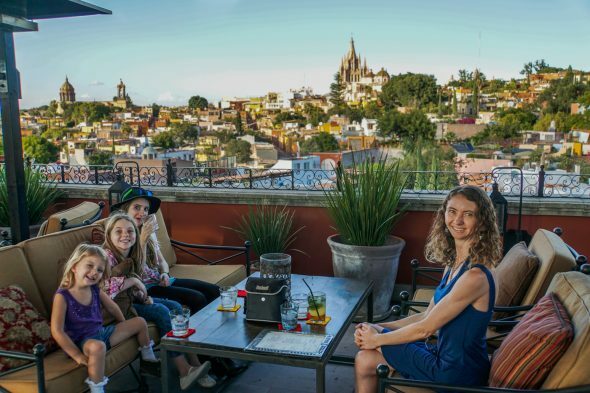 We rested at the cultural center for a while, taking photos and enjoying the view overlooking the city, before heading off to Luna Rooftop Tapas Bar for dinner. 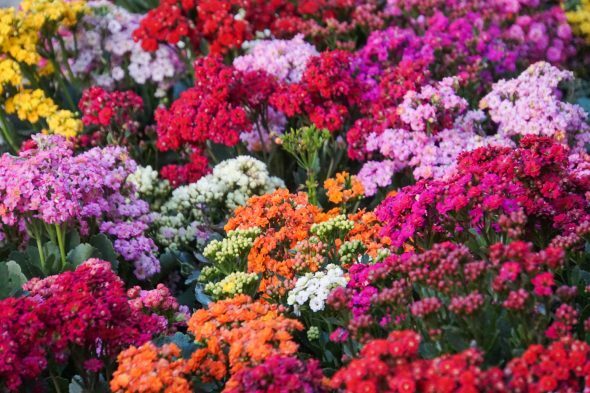 It’s located on the top of the elegant Rosewood Hotel, whose amazingly bright and colorful flower beds we admired many times on our previous walks past the grounds. We arrived before sunset to soak in the breathtaking view over the city as night settled. Brandon played a funny prank on me one night as I was in-between listening to some mindfulness recordings through my earphones. He secretly ran a program through his computer that made it so he could send messages to me through the audio system on my own computer. All he had to do was type whatever words he wanted to send and specify the tone he wanted them to arrive in, for example, a whisper. So, all of a sudden, through my earphones I heard a whispered “Hello,” and I kind of burped and had some unusual sounds coming through my body about that same time, so although I distinctly heard, hello, I figured it must be a trick of my senses in relation to the extra air working it’s way through my system. I found it quite funny, yet easily managed to rationalize it away as a trick of the mind. Since Brandon was sitting right next to me, I mentioned it to him and we both got a good laugh for a few minutes, though I let him know I was feeling just a tad bit creeped out. A minute or two later, the voice came back through my earphones and whispered, “What are you doing?” Yikes?!! Well, there was no passing that one off as indigestion. About now is when I demanded to know how Brandon was doing this, thinking it must be somehow coming from him. He skillfully convinced me he wasn’t doing anything, and he was just as perplexed as I was. Ha! We talked about how maybe it’s some kind of computer virus, albeit an extremely unsettling one, and passed it off with lots of apprehensive laughter, with me feeling admittedly a bit edgy. He gave me a few minutes to recover before delivering his next message in the form of a whispered, “I love you” through my earphones. Ahhhhh!!! Get these things off me!! I gave the earphones to Brandon so he could hear for himself. I was glad to be rid of them, and intently hoped that the voice would talk to Brandon as well, and not only be picking on me. After about a minute he assured me that, yes, he too had heard the voice saying “I love you.” He then promptly gave me back the earphones. Not long after this, the voice kept repeating “I love you” in shorter succession, and since Brandon wasn’t being quite stealthy enough at this juncture, I caught him typing the messages into his computer as he was sending them to me. His next one would have been something to the effect of “This is your computer. I love you. Thank you for using me.” I’m quite glad it didn’t get that far; no one would have ever believed my computer was actually talking to me, not even the psychiatrist I would likely be needing to visit. I really think Brandon may be missing his true calling in life, as a prankster. 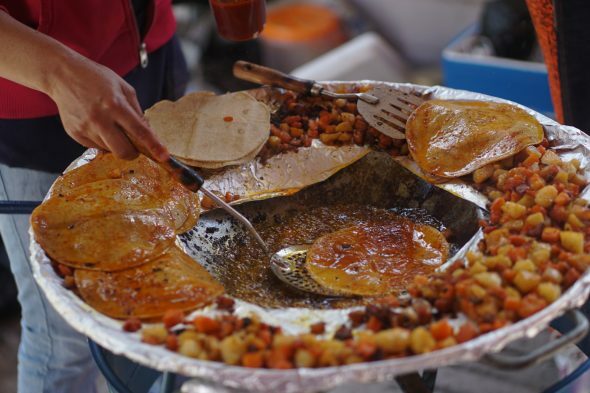 We met some new friends for a meal at Baja Shrimp Taquito one afternoon and then went to an ice-cream stand, Nieves de Garrafa, which has been in business almost 50 years. We ate our dessert in a beautiful courtyard with a fountain where we had a picture taken together with help from one of the security guards. We were invited to dinner at the home of these same friends one night where we enjoyed a lovely meal and conversation together. Emily played some live music for us and she also debuted her professionally produced recording of Courageous with all of us, since we received it through email from her recording engineer during our visit that night, and we couldn’t wait to hear it. 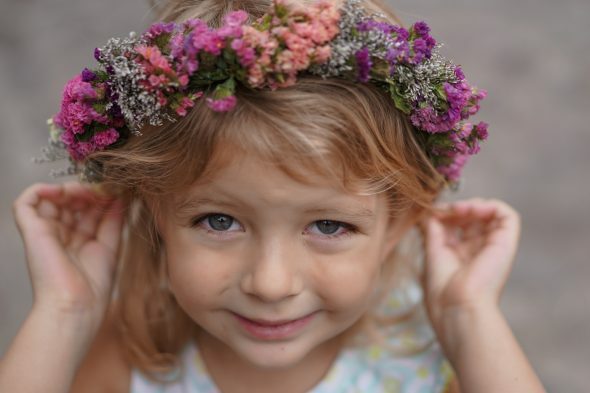 Their daughter Emma does video editing, and has even collaborated with Emily on a music video to go along with it! 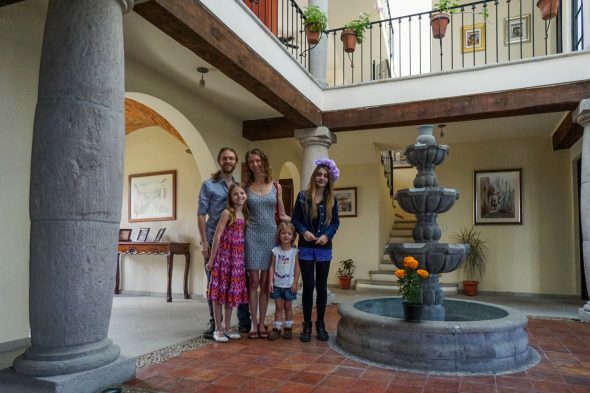 They actually did the filming together while Emma was staying with us for a multi-day sleepover during our time in San Miguel. We also met one of the admins of a Facebook group we’ve been a part of ever since our Costa Rica days, called Families on the Move. He travels with his son and keeps an active blog, 1dad1kid.com, where you can read about their adventures. It was so great to finally meet them! We had lunch in a nice peaceful garden area of a delicious restaurant called Mi Cafecito and then chatted together in Juarez Park for a while afterwards. We’ve now met all six admins of that travel group in person, both past and present, since we joined several years ago. 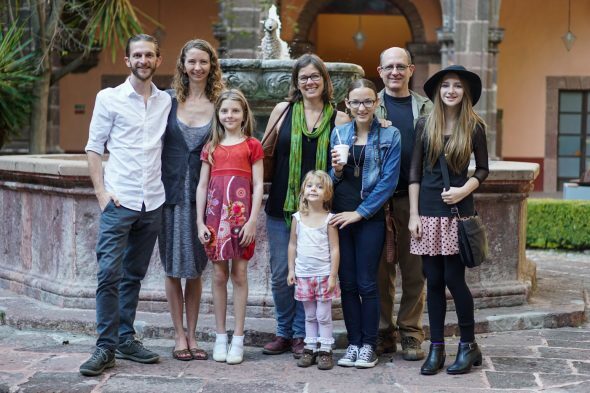 It’s been such a great resource to connect with other traveling families. We have a couple of other groups we like for that too. If you’re interested, be sure to check out Worldschoolers and Families Who Love Travel, which are both Facebook groups as well. 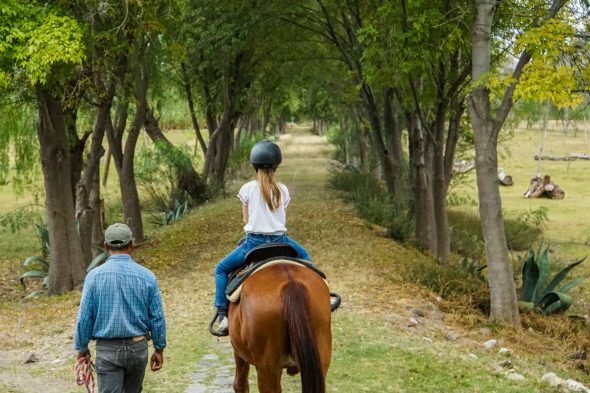 We went horseback riding one morning on a tour from 3señores. 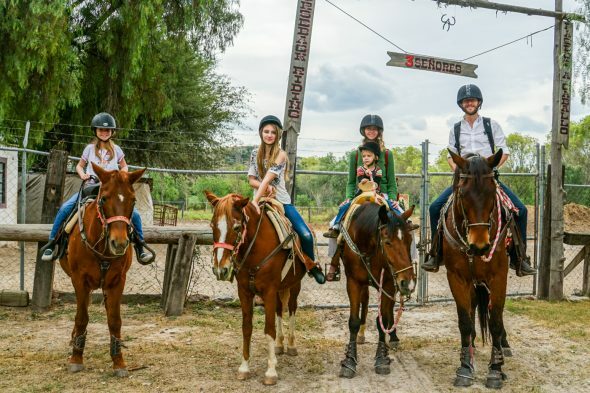 It was great to be with the horses and to see the girls have fun riding. We rode to an old church and learned a bit about the plants and history of the area. The river used to be really clean and people would bathe and wash their clothes in it, but now with the growth of San Miguel it has become too contaminated. Many of their elders used to live to be at least 100 years old. For example, our tour guide’s grandfather lived to be 105 years old and died of a fall, not because he was sick. They lived a more healthy lifestyle and had a really connected community. She told us about some of the different types of plants and fruits they would eat, including some red berries in the shape of blueberries, which are hard to find now and almost extinct, but reputably very delicious. 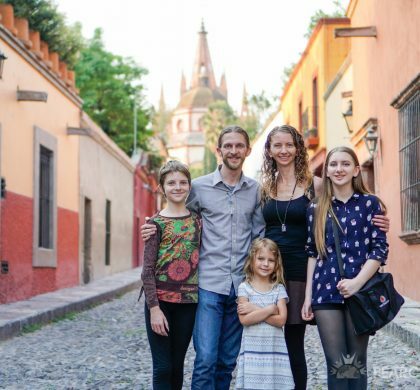 We took a four hour bus ride to Mexico City a couple of days before we flew out of the country. 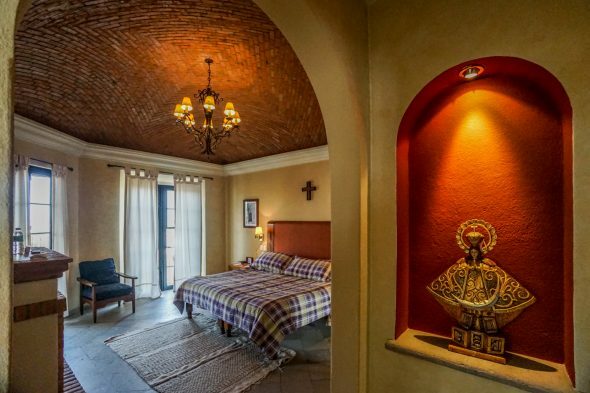 We stayed in a lovely town house in La Roma neighborhood, whose antique decor inspired us to slow down and appreciate the arts and creativity, and just relax into the moment. We walked around a street market with a playground nearby, which even had some big inflatables to jump on and ball pits to play in. 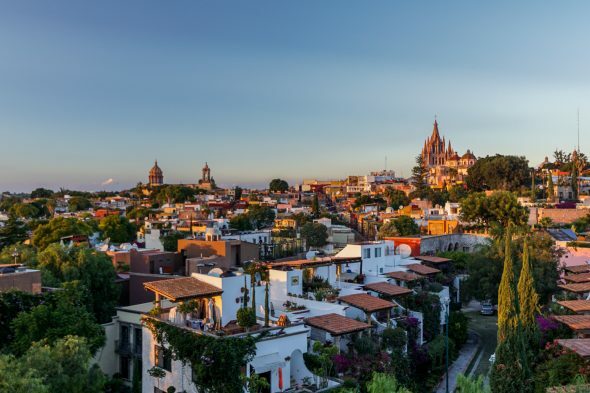 We definitely took a liking to San Miguel de Allende, in fact, we’d love to go back and spend more time, maybe next year. Hopefully you’re also interested in a visit after reading this post and we can all hang out there together! 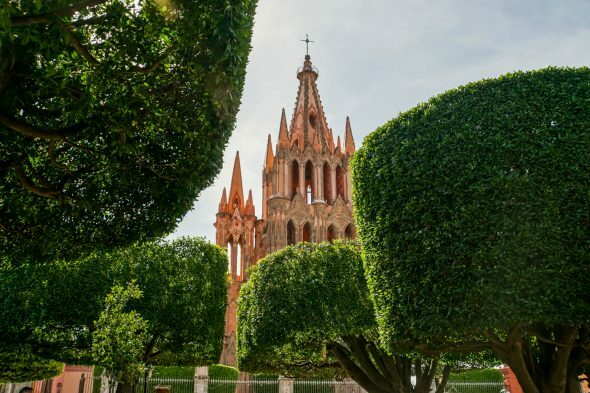 Have you ever been to San Miguel, or other parts of Mexico? What did you like or not like about it? We’d love to hear your experience below. I love this town, and am looking forward to going back before too long. Looks like the price on that vacation rental we stayed at has doubled, though! Or maybe now is just the high season price. Anyway, thanks for the great post to capture our memories of the experience. Such a picturesque town! And I already long for more of the food… As well as the friends we made there. And I’m glad you enjoyed my little prank. :) I have to give a shout out to Dustin Davis (https://twitter.com/dustindavis) for the idea. Thank you, love! I’m excited to go back as well and hope we can still get a good price on a lovely rental home when the time comes. I’m a bit afraid to ask, but I wonder if Dustin Davis has any other tricks up his sleeve? What a lovely adventure! Out of curiosity, what mindfulness meditations were you listening to? I have been using Headspace for a while and would like to try something different for a change of pace. Always love reading about your adventures! I did the extended version of the course which gave me more time to go through the material, since I like to take things slowly. I just finished it yesterday in fact, and I started it clear back in October! What a colorful, wonderful country and adventure! 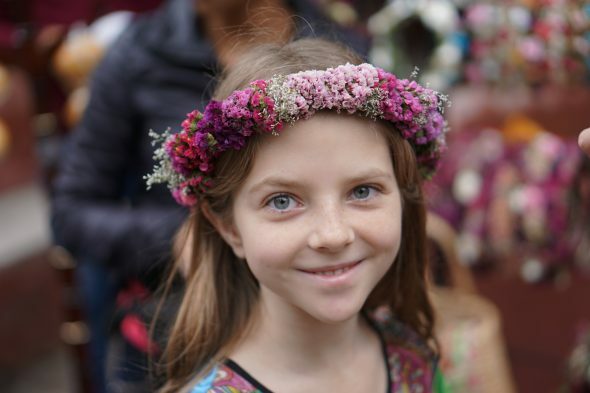 Love the flowers, face paint and all the beautiful costumes for the celebration. And sounds like the food is definitely something to return for! Haha! I’d forgotten to make that connection with the bees in Bali. I think they like the doTERRA essential oils as much as we do, actually. I always apply a variety of oils there, so that’s probably what they’re after. Yes, I do believe you have made your mark where Brandon’s brilliance is concerned, for sure! I LOVED this post! I really enjoy the writing style. It made me want to go to this beautiful fun place. I felt as though I was there with you. I loved the pictures of the family, seeing the fun the girls were having. Thank you, Grandma! I’m so glad you enjoyed it! We would absolutely love to have you travel with us in-person sometime!